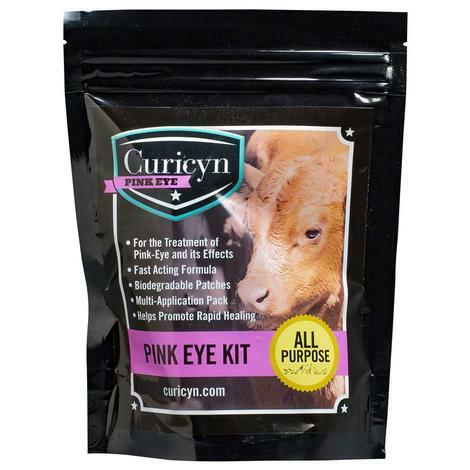 The Curicyn Pink Eye Kit comes in a resealable bag. This is an aggressive, non-toxic solution that helps treat the infection within 3 days. This kit includes a 3 oz. bottle of Pink Eye Solution, 5 biodegradable patches and a tube of adhesive. The patches help isolate the contamination as well as keep dust, debris and other irritations away. Curicyn Bodygard flea, tick and insect repellent. 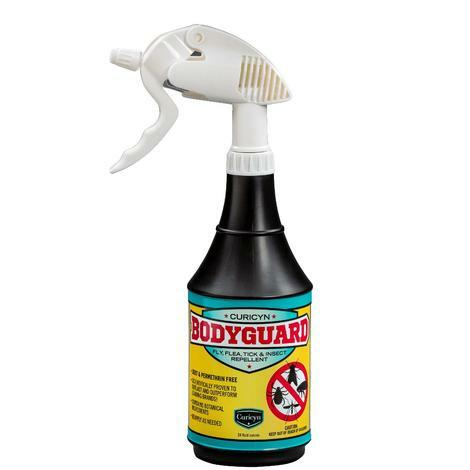 Curcyn Bodyguard Fly Spray is a nature derived deet free repellent scientifically to outlast and outperform leading brands. This formula is safe and effective on livestock, horses, ponies, dogs and more. 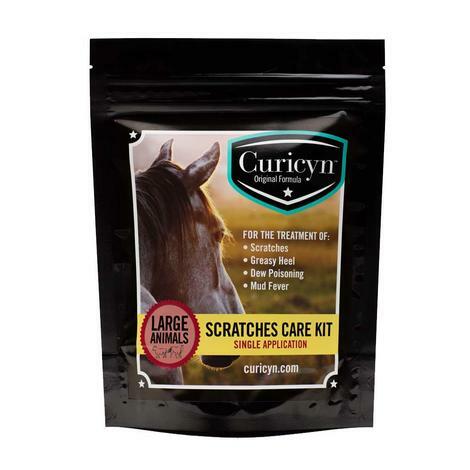 Curicyn Scratches Care Kit contains powerful ingredients that promote rapid healing and aids with skin ailments. This kit is excellent for treating persistent bacterial skin conditions like scratches and greasy heel. Contains an absorbent and adhesive pad, an integral delivery tube, a roll of vet wrap, and a 3oz. bottle of Curicyn. 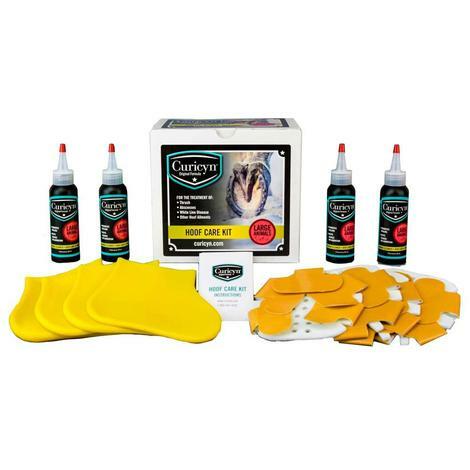 Curicyne Hoof Care Kit is designed to address bacteria at the source and promote rapid healing. Ideal for treating white line disease, thrush, and even hoof abscesses. This single kit contains: a molded rubber boot, an absorbent and adhesive hoof pad with an integral delivery tube, and a 3oz. bottle of Curicyn. 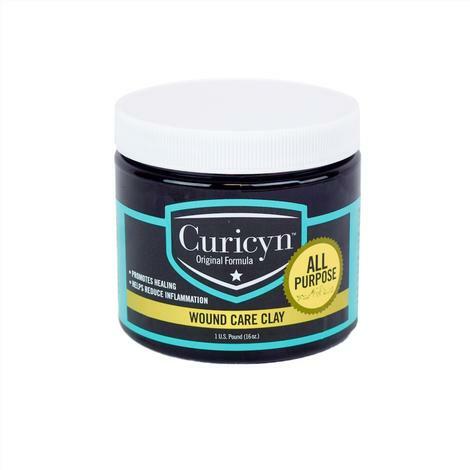 Curicyn Wound Care Clay promotes healing and helps reduce inflammation. This fast acting formula is safe for most livestock animals and works on open wounds or skin disorders in areas that are diffuclt to bandage or cover. Proven effective on hoof abcesses, saddle sores, open lacerations and a variety of other issues. 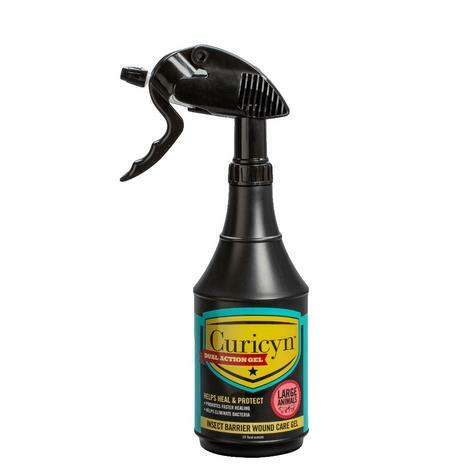 Curicyn is now available in a sprayable, gel formula that will "stick" to the wound and promote rapid healing. 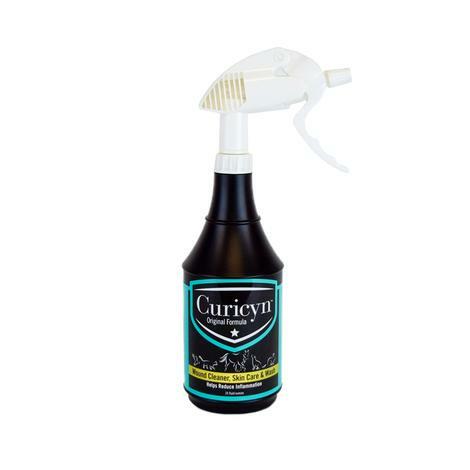 Curicyn Gel also includes Geraniol (all natural botanical repellent) which keeps flies and gnats away as the wound heals. This highly effective topical wound and skin wash formula promotes the animals own natural healing process and prevents bacterial growth. Curicyn Original Formula is a wound cleaner and skin care spray that helps to reduce inflammation and speed up the healing process. 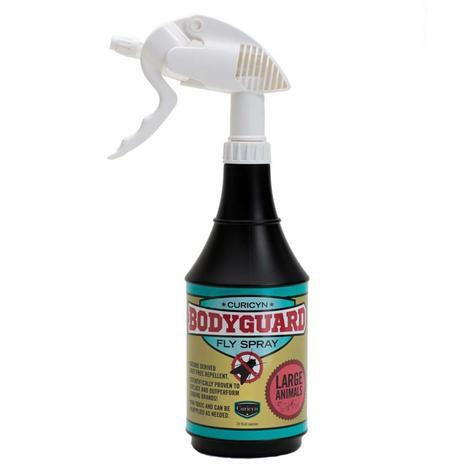 Promotes the animals own natural healing process and prevents bacterial growth.